To celebrates its seventh anniversary, bedding purveyor minka tapped N. HOOLYWOOD EXCHANGE SERVICE on a pillow and cushion collaboration. Looking to create a quality product, N. HOOLYWOOD enlisted Kanazawaya to produce artisanal interiors and Hippopotamus for a functional covering. 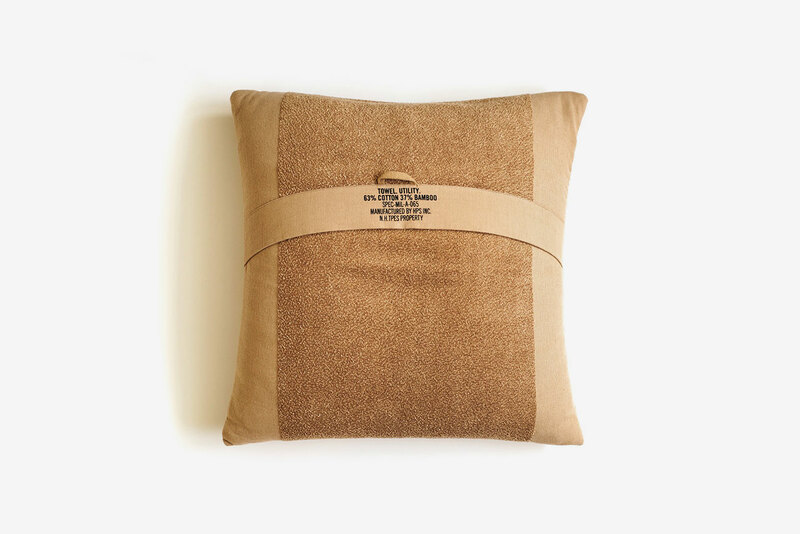 The covers for the big pillow and cushion display a military-spec inspiration and are crafted from a mix of organic cotton and bamboo fiber, which are spun into a short fluff towel textile. Finishing up each piece is a mil-spec-style hanger loop and detailed notation found on the opening band. Priced between ¥14,904 and ¥44,928 JPY (approximately $132 and $397 USD), the minka x N. HOOLYWOOD EXCHANGE SERVICE collab is set to release exclusively at minka on November 23. In case you missed it, N.HOOLYWOOD recently dropped a set of limited edition pieces for Tokyo Fashion Week. In both “Black Diamond” and white. The lightest iteration of the American supercar. Allen Iverson’s new signature sneaker. For Reese’s Peanut Butter Cups.